It was bitterly cold, but the procurement ice warriors turned out in force yesterday at the QEII Centre Westminster for the first big international procurement event of the year - eWorld Procurement and Supply. (Good job it wasn't on today, as we suspect no-one would have made it!) There were over 200 delegates there we understand from event organisers Revolution Events - who have been expertly running these conferences for years, it has to be said. (Peter's note; I was very impressed to see well over 100 people in the keynote even at 9.30am, given trains from some parts of the London area weren't running - and Jamie Foster's session was very good, a real practical, practitioner focused start to the day. We'll have more on that shortly). And another nod to both KnowledgeBus (for the welcome butties and hot drinks on a cold winter/nearly spring morning) and to Proactis for the 'paid-for' lunch - so nice not to have to go foraging in the snow at lunchtime! But enough of weather and food - the wonderful thing about eWorld is how flexible your day can be. It has a great drop in/drop out culture - which means you can turn up and attend whichever sessions you chose without having to commit in advance to a whole day if you are unable to. In the long run that probably means they get an even bigger audience! However, that doesn't apply to us - we like to get to see as many sessions as possible; it's unfortunate we can't get to see them all. But we will be bringing you coverage of the ones we did attend over the course of the next couple of weeks, with a few interviews thrown in with presenters we managed to catch up with, or with unsuspecting delegates we managed to corner. There was a good range of the leading software firms present, Proactis, Basware, SAP Ariba, Wax Digital, Tradeshift, GEP, Determine, Scanmarket, Market Dojo and more, as well as some less frequent attenders, such as Mercateo, who talked about managing low-value / tail spend and are now partnering with SAP Ariba as we reported last year here. Peter will shortly have more in-depth coverage of his session titled - Can Procurement be a Force for Good? Here he looked at some of the ‘non-traditional’ ways in which procurement can really make a difference. He looked at what procurement is currently doing and how it can do more to add value in areas of social importance, and presented some key points to consider if you and your organisation want to be that force for change, without losing sight of the day-job and getting totally over-burdened! We'll also have more on Peparing for Brexit - Changing demands, skills and supply chains, from Andrew Daley of procurement and spend management firm Edbury Daley, a session which revealed what the (it has to be said mostly manufacturing) procurement workforce is currently doing to prepare. And those are the sessions that we feel you get a lot out of at eWorld, the sessions that are discussion-led, where people get invoved and express opinions and share ideas that you can take home. So we'll be covering what was a good exploration of technology and digitisation and the principal challenges for procurement folk, which was steered by Bastiaan van Drempt of Coact Consulting Group. And then there are the more practical sessions, like the one from Trevor Tyler at Xoomworks on the simple steps you can realistically take towards digital procurement. More on all of that next week. Finally, while we wouldn't want you to think that Peter and I slipped out to the Westminster Arms at lunchtime (as if we would do that, of course not), it was interesting to witness a protest march relating to the lecturers' pay dispute passing by the front of the conference centre. 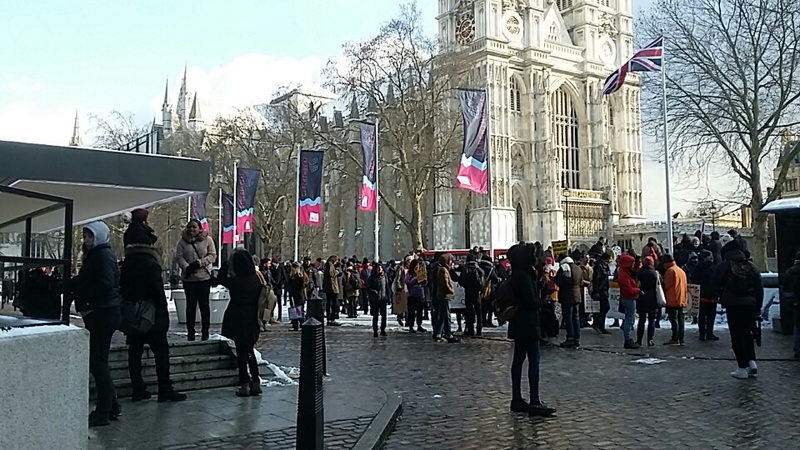 Thousands of people, on the coldest day of the year - so whatever you think of their case, we'll give them points for commitment!